Spiking Oil Prices: Time To Worry Yet? The price of the main U.S. oil contract hit $100 a barrel Wednesday — the highest in more than two years. And when the price of oil rises, the price of just about everything else — driving, heating, eating, shopping and more — starts to move up too. Is it time to get really worried? Spiking Oil Prices: Time To Worry Yet? Since Jan. 1, pump prices for gasoline have averaged well above $3 per gallon. Watching the price of oil go up these days is a little like watching a river rise. At what point do we need to get the sandbags? When should we sound the warning horns? What is flood stage? On Wednesday, the main U.S. oil contract hit $100 a barrel before retreating to $98.10. That was the highest price in more than two years. Of course, prices could always go down. But with increasing global demand and widespread unrest in the Middle East, it's possible that the price of fuel — by the barrel and by the gallon — will continue to rise. And when the price of oil rises, the price of just about everything else — driving, heating, shopping, eating and more — starts to move up too. Flood level may be closer than we think. As analyst Andrew Lipow of Lipow Oil Associates in Houston points out, "Although the crude oil price that one sees in the futures market is around $95 per barrel, the fact is that the U.S.A. imports around two-thirds of its crude oil requirements — and the cost of much of that crude is currently well over $105 per barrel." Lipow closely watches retail prices for gasoline and diesel. "As they rise above $3.50 and $4 per gallon respectively, there is a noticeable impact on consumer spending and business costs," he says. Diesel prices are a big factor in the cost of transportation, he explains. "From the local delivery services to the transport of food to supermarkets and consumer goods to the shopping malls, the cost of doing business rises and is eventually passed on to the consumer," he says. Then, as the public spends more money on energy, "there is less money immediately available for other areas of consumer spending like going out to eat and spending on entertainment," Lipow says. 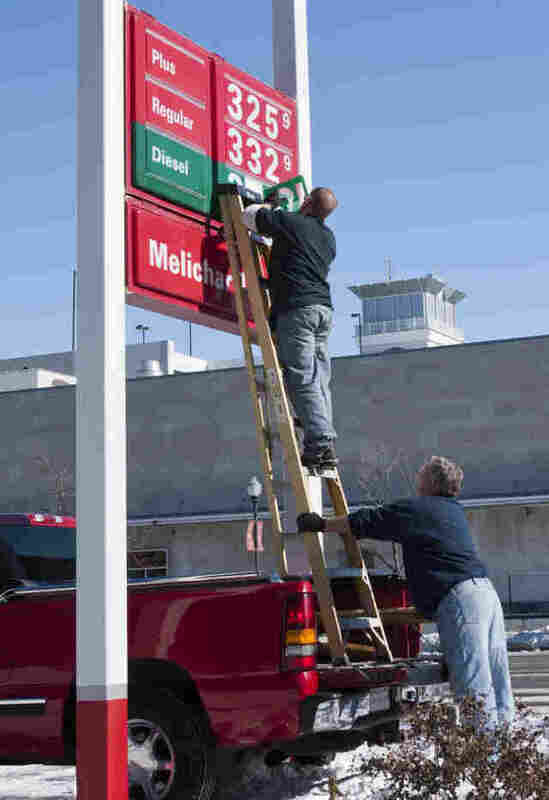 If high fuel prices persist, the impact spreads to larger buying decisions. "Consumers defer purchases of new appliances or cars," he says. For Cambridge Energy Research Chairman Daniel Yergin, the panic point will hit when oil routinely costs more than $100 a barrel. That benchmark, Yergin tells CNBC, "starts being a worrying setback for the economy. It hits consumer confidence and spending — and a lot of businesses, beginning with airlines." For Jack Ablin, CIO of Harris Private Bank, the trigger point may be closer to $140 a barrel. He sent a message to CNBC Tuesday saying that when a gallon of gas hits $4, that "will begin to weigh on the consumer and our incipient recovery." The relationship between the price of oil — measured by the barrel — and the price of gasoline — measured by the gallon — typically is a close one. As an example, Ablin points to 2008. When oil rose above $130 a barrel that year, the price of gasoline at the pump rose to more than $4 a gallon. Airlines. Even in the $85- to $95-a-barrel range, the airlines have already seen a "decline in their profitability," Lipow says. Nima Samadi, a travel and tourism analyst at IBISWorld, says that every dollar increase in the price of crude oil results in about $1.6 billion in new costs for air carriers. "Airlines will attempt to pass increases in fuel costs on to customers by raising ticket prices," Samadi says. But competition is intense among airlines, so attempts to raise fares may flop. If that happens, Samadi says, it would be "difficult for the less profitable and efficient airlines to survive." Rental Cars. "The last time there was a major impact on rental fleets was when retail fuel prices exceeded $4 a gallon," says rental car industry consultant Neil Abrams of Abrams Consulting Group. "Based on past experience, the way customers ... respond is by reserving and demanding smaller, more fuel-efficient vehicles and shunning larger, less efficient vehicles like SUVs." This dynamic, Abrams says, "significantly impacts rental operator fleeting decisions since they need to have vehicles in their inventories that customers want — plus there is a collateral impact on residual values when the companies go to sell their fleets into the thereafter." Pleasure Boats. Liz Walz, editor of Boating Industry magazine, says industry executives tell her that when crude oil hits $100 per barrel, boat usage goes down. "When fuel prices have risen in the past, leading dealers have encouraged boat owners to use their boats closer to home by offering rendezvous, dine-arounds and other boating events on local bodies of water," she says. They also offer gas gift cards with purchases. Recreational Vehicles. "Gas prices could influence whether people buy an RV because they perceive it to be too expensive to own or use an RV," says Greg Gerber of the RV Daily Report. But "in the past, when gas prices have climbed to $4 per gallon, RV owners responded by taking their RVs on shorter trips. They did not stop RV-ing." Cruise Lines. For the cruise industry "there is no breaking point," says Oivind Mathisen, editor of Cruise Industry News. "In the past, once prices are considered too high, fuel surcharges were added to passenger tickets. That may happen again, pending the price of fuel." In anticipation of spiking oil prices, Mathisen says, "the cruise lines have fine-tuned their operations — in terms of itineraries, sailing speeds, new technology, etc., to minimize fuel consumption." As a result, the companies have cut fuel consumption by about 3 percent per year for the past several years. In addition, he says, "the lines claim that the newest ships are some 20 to 25 percent more fuel efficient than the generation before." Mathisen expects rising fuel prices to trim earnings, but "not put the major companies into the red." James Hamilton, an economics professor at the University of California, San Diego, says that when it comes to consumer spending, there is no single trigger point "below which we're OK and above which everything goes wrong." But he does point to these numbers: A 10-cents-per-gallon increase in the price of gasoline takes away about $14 billion from consumers' discretionary spending power over a year. And that size of an increase at the pump "has historically been associated with a half-point drop in the index of consumer sentiment." On the upside, Hamilton says, employment has started growing again. "This will help consumers more than the gasoline prices hurt," he says. "I expect economic growth and recovery from the recession to continue, despite the drag from oil prices."